ProtectEar USA is the exclusive licensed provider of dB Blockers. How simple? Training and fit testing takes less than 10 minutes and it can be done right on the line*. Ease-of-use and real-time testing are what makes FitCheck Solo™ the best hearing protection fit testing system money can buy. What can you use the system for? FitCheck Solo™ will measure any earplug from any source. No additional special devices are needed. Just the same earplugs they now use or even ones they are considering using. 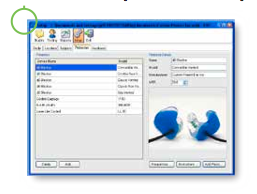 Repeated fitting of an earplug with feedback and instruction in between will give them the skills, confidence and know how to achieve the attenuation they need. When you are trying to change habits and attitudes, nothing is more persuasive than being able to see the results. Any associate can check their personal attenuation rating (PAR) any time you want to let them. FitCheck Solo™ helps take the guess work out of matching the correct hearing protection with known noise exposure. It’s the only system that can test the actual earplug a person is wearing without having having them first remove them. That’s what makes it the most accurate system currently available. Based on the HPD Well-Fit System developed by and licensed from CDC/NIOSH and refined by Michael and Associates, FitCheck Solo™ is tested to be the most accurate system currently available for field attenuation measurement. It is also the only system that can measure any earplug with the actual plug worn the way it was fit that day. Designed for the original FitCheck system and tested and improved over the last 20 years. This speaks directly to the dependability and durability of this over ear headset. This is the signalling device for the system. Simply scroll the wheel and click at the appropriate points during the testing. One year online training and telephone support is included as a part of every FitCheck Solo™ system when purchased through CPE.